As many of you avid Tronster.net readers know, I have been promising a picture from Africa. Well now you have it. 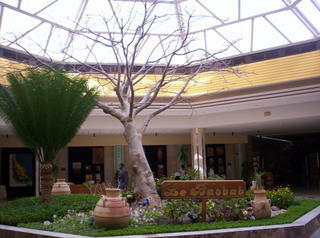 This tree is located in the lobby of the Meridian in Dakar, Senegal. The Prince of Saudi Arabia paid to finish the convention center for a meeting of the African nations a few years back. I was told that this was the nicest hotel in all of Africa. I really thought the pillows were great. They were huge, 2' x 2'. The TV had it's limits, only showing French stations and a couple of the Local languages. There was an English version of the world news, but they play the same news in a cycle of about a 1/2 hour.